Editor's note: This column was authored by Christian Barnard. Education Secretary Betsy DeVos is under scrutiny once again, this time for allegedly trying to use federal funds to “sneak guns into schools.” These harsh criticisms mainly come from gun control advocates and educators in response to an August 22 New York Times report that said DeVos was considering using federal funds to purchase weapons for school staff. Other reports have characterized the Education Secretary as exploiting a “loophole”—a federal grant program that fails to explicitly prohibit the spending of federal dollars on guns. But this widely-circulated narrative is ignoring key facts. Using federal money to arm schools was not DeVos’s idea. In reality, the secretary has tried to end the very grant program she’s accused of abusing. The program in question is Title IV of the Every Student Succeeds Act (ESSA). Title IV is a $1.1 billion initiative for districts to improve student safety, health, and well-roundedness. Because it gives states broad discretion in funding programs promoting the arts, safety training, and computer science, it is considered by some educators to be one of the most flexible federal education grants around. Title IV funding reached $400 million in the 2017-2018 school year. But in the wake of tragic school shootings in Parkland, Florida and Santa Fe, Texas, Congress approved a $700 million funding increase for the next year, with the intent of increasing financial support for mental health counseling, crisis training, and violence prevention in the wake of school shootings. Contrary to the popular notion that DeVos proposed using Education Department money to advance a gun agenda, it was the Texas Education Agency that wrote a letter asking the department if Title IV dollars could be used to purchase firearms. In fact, it is likely DeVos had not even considered the idea prior to the Texas inquiry—and it is hardly her fault the ESSA statutory language fails to mention guns. In fact, the bill was written by Democrats and signed into law by former President Obama in 2015. The education secretary’s critics are trying to have it both ways. In their original FY 2019 budget proposal from February, Devos’s Department of Education proposed cutting Title IV grants altogether. At the time, the secretary’s opponents accused her department of not prioritizing student success. But Congress then decided to instead increase this year’s Title IV grants to $1.1 billion—and now, DeVos’s critics act as if, all along, she’d been conspiring to use federal money to arm schools. The mere fact that DeVos did not immediately shoot down Texas’s inquiry was enough fodder for outrage from teachers and gun control advocates. They threatened the secretary with a potential lawsuit, arguing that allowing states to purchase guns with federal dollars violates a longstanding federal government practice of prohibiting the use of federal funds to buy weapons. They also think allowing for the purchase of weapons goes against the original intent of the Title IV legislation. It is true that all other federal grant programs for schools prohibit the purchasing of weapons. But a legal case against DeVos would lack merit. As Matt Larosiere, a constitutional lawyer at a DC-based think tank, put it, “There is no cause of action that arises because your favorite laws forbid something, and another law does not.” In other words, the fact that other types of federal grants explicitly prohibit gun purchases is no reason to suppose that this one should do the same. Larosiere added that the original intent of the law is likely irrelevant in this case, since the legislation clearly omits any restrictions on firearms. DeVos’s openness to the idea of arming teachers is rooted in her department’s broader goal of allowing states to pursue their own educational priorities. After all, there are 172 school districts in Texas that allow teachers and staff to carry guns on school property, and DeVos wants to respect the decision of these elected school boards. Federal school grant programs that carry a high number of categorical restrictions—such as provisions restricting the kind of safety measures schools can support—tie the hands of districts and individual schools when making budgetary decisions. Reason Foundation, a California-based public policy think tank, has demonstrated how restrictions on other federal education grant programs seriously limit their effectiveness at the state and local level because states are often not allowed to make their own funding decisions. DeVos is wise to hesitate in telling states and school districts what to prioritize with the Title IV grants. Yet all the outrage is unsurprising, since DeVos is one of the least popular members of the Trump administration. Even so, the idea that she is trying to serve the interests of gun manufacturers and the gun lobby, as the Washington Post editorial board claimed, is a ridiculous stretch. 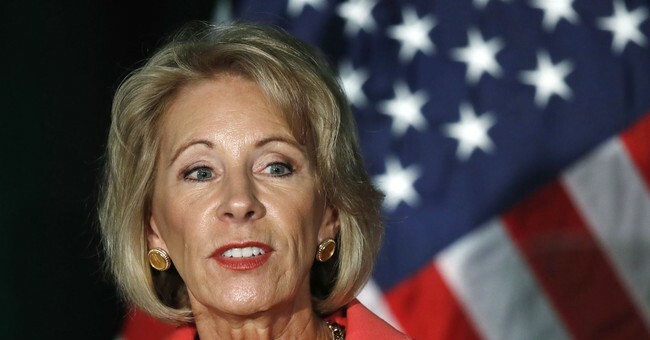 The education secretary cannot be blamed for providing clarity on a program she neither came up with nor wanted to fund, and her critics are wrong to condemn her without the full context. Christian Barnard is a Young Voices Contributor and a policy researcher with the Reason Foundation. Follow him on Twitter @CBarnard33.